I’m going to make a confession to start because I think it will make me feel better. I’ve been feeling overwhelmed with keeping up with the clutter and organizing but it got to me tonight. I like to see clear surfaces. It drivers me bonkers when surfaces have clutter. I try to keep the kitchen counters uncluttered most times – at least before I go to bed. Makes me feel better. When you live with 4 other people and three of those are under 10, it gets pretty hard to maintain tidiness. I’ll admit, we don’t have a cleaning lady or nanny – I’m those and M and I do everything. We used to have cleaning ladies come and clean but after the incident when they stole from us, we couldn’t bring ourselves to trust anyone else. I’m going to use this post to declutter my mind. Perhaps I might be lucky and someone will give me helpful advice on how to deal with all this mess. This issue has been on my mind for as long as I can remember. I recall the days when I was heavily pregnant with W and painting all the kitchen cabinets antique while. These were the days when W would nap in the crib for over 1.5 hrs at a time. After putting her to sleep, I’d come down, madly paint, varnish, and screw the finished doors on. It made me proud. It’s just how I am. When I set my mind to do something I do it with full force. No stopping till it’s done. It all started with the fridge surface. There were Holiday photo cards and they were just placed anywhere any way. Magnets strewn around and papers stuck on that didn’t need to be there. In the end, we recycled most of it and kept the fridge front uncluttered. 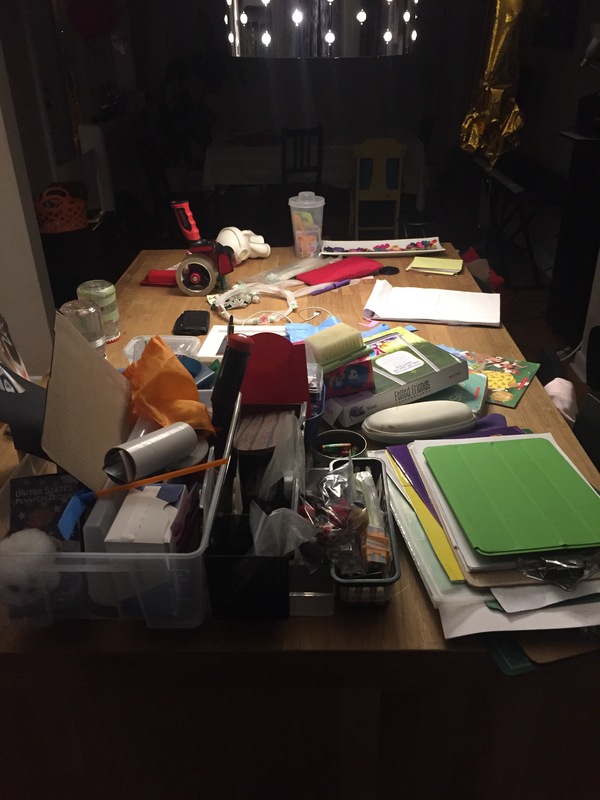 Then there were the papers – kids artwork, doodles, and schoolwork. One is in grade 1 and the other is in SK. So their schoolwork is, for the most part, not that big of a deal. So I recycled most of it and kept some in a binder. The oversized artwork I kept in a plastic folder. That felt good. Then I wanted to do more but M was getting tired. He has a cold and wanted me to sit and build some micro ships with him and eat dark chocolate. We started bickering and calmed down enough to go sit on the couch. Of course, after a few minutes, the baby wakes. We’re very lucky to live in a spacious house. Not including the basement, we have about 1700 sq ft of living space. Unfortunately the house was not built nor designed for functionality. An extension was built to add an extra bedroom as well as a family and breakfast room. Too many walls and long spaces make it really tough to design living spaces. We’ve rearranged our rooms and furnitures so many times that I can’t think of how many times. Dreaming of moving is just pointless because we can’t afford any other house unless we move to the suburbs. So, the biggest area of clutter is the basement. Yes. The room where the water tank and humidifier are. It’s a disaster. There are mounds of legos, tools and just stuff. It drives me crazy to go to that room. Yes I also have my pile of fabrics in two cabinets and the drawer full of beads from our jewelry making days. Next are the kids bedrooms. Kids love to collect stuff and store them in boxes and containers. Sometimes they just lie around collecting dust. After I spent time tidying up their desks it is cluttered again. Clothes. I feel we are drowning in clothes. We are lucky to have pass me downs for kids clothes as it is a huge money saver. I’m in the process of vacuum sealing Vs small clothes to keep for W. Even though it may be at least a year before she can wear some of it, it doesn’t make sense to get rid of them only to buy them again later. I, myself, have noticed that I only wear certain pants and shirts since having W. My body has changed and a lot of my clothes don’t fit the same way anymore. So I’m probably going to have to go through my stash again and purge. Craft supplies. Yes, I love crafting. I’m very proud of the scrapbook i made for Z. It is nearly impossible to do anything like that with your 2nd or 3rd kid. I still want to create a book for both girls but am feeling overwhelmed since i have to go through a lot of photos to print. Sigh. And that brings me to my next point. We decided to extend my leave until Sept. This has put even more pressure for me to be super productive with my time at home. I’m finding it very challenging. W is not napping long enough for me to do anything significant. I’m finding that there are so many things that need to get done. It just doesn’t end. How does one cope? I’d love to hear from you?